World Vision believes every child deserves the chance to reach their God-given potential. More than 1 billion people around the world have some form of disability — many of them children. Some have been affected by congenital diseases or malnutrition. Others have been disabled by war or conflict and other dangers such as infectious diseases. In developing countries, children with disabilities are often unable to attend school, play outside, communicate, be included in the community, or get access to specialized resources and care. Negative stigma or superstition among their parents, neighbors, and community leaders cause or reinforce these barriers. Children in these situations can become isolated, lonely, and may have little hope for the future. World Vision seeks to address these barriers by ensuring children have equal access to healthcare and educational opportunities, helping children have a voice in community affairs, and sensitizing their parents and community leaders to help eliminate stigma toward children with disabilities. For most of Tamasha’s life, she could not sit up by herself and was always lying down. Born with disabilities in her arms and legs, her life in Malawi wasn’t easy. Her mother, Emily, says it was difficult to make sure someone was always watching and caring for her. When Tamasha turned 5, Emily tried to send her to a nearby kindergarten. However, the family was not able to accommodate Tamasha’s special needs at school all day. So Tamasha, now 7, has never been able to attend school, and she has spent a lot of time indoors alone. “It pained me as a mother knowing that her absence from school meant that her future was doomed,” Emily says. In July 2017, World Vision and Wheelchairs 4 Kids provided wheelchairs to Tamasha and other children with disabilities in her area. Emily was so relieved. It changed their family’s world, Emily says. 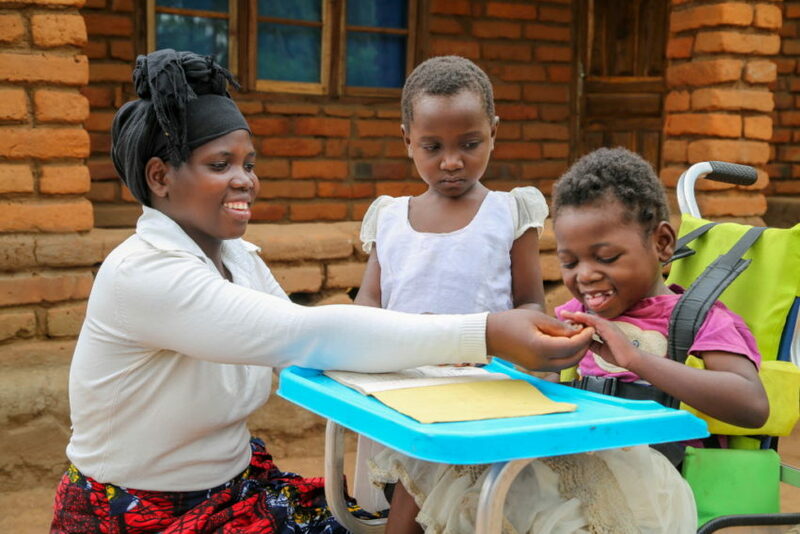 Tamasha has since been able to enroll in school because the wheelchair allows her to sit up on her own. Emily, who works alongside her husband to cultivate maize and beans on their small farm, no longer has to carry Tamasha when she does chores or walks to get water. And best of all, Tamasha can play outside with her friends now. “I am relieved and I sometimes shed tears of joy whenever I see my child playing with friends,” Emily says. As followers of Jesus, we are called to seek out and care for the most vulnerable among us — people like Farhad. Start this journey by joining us in prayer for children with disabilities around the world. Pray for children with disabilities to be included. Children with disabilities often face discrimination, bullying, neglect, abuse, and violence. But they have God-given gifts that are often overlooked. World Vision’s work in disability inclusion spans everything we do. We envision children living with disabilities afforded the same access to healthcare, education, government services, and overall dignity as every other child in their community. We treat them with dignity and respect in our day-to-day programming, advocate for their rights, and provide disability awareness training to parents, caregivers, and local leaders to eliminate stigma. Lord, help children with disabilities know they are loved and they matter to You and the world. Through Your Spirit, help workers train parents and community leaders to walk in humility to eliminate destructive stigma toward people with disabilities. May children with disabilities be afforded improved access to basic services, healthcare, and education. Pray for improved access to medical care. Globally, as many as 500,000 children are visually impaired each year due to vitamin A deficiency. And few people with disabilities in developing countries have access to rehabilitation. As many as 80 percent could have their needs met within their community. But medical treatment costs can be prohibitive or altogether inaccessible for people living in extreme poverty. Stigma and shame among caregivers can also cause them to try and hide issues their children may be experiencing, often making their health situation worse. World Vision partners with specialized organizations like Operation Smile to provide dental, medical, and other healthcare support. Our trainers and staff listen to community members when they candidly raise concerns about families in their communities and respond as appropriate to look out for children’s well-being. Lord, our hearts ache for children with disabilities who lack access to care or whose families who cannot afford therapy or treatment. Spur national officials and healthcare professionals to create policies and develop systems that provide quality, affordable, accessible care. Soften the hearts of parents and caregivers hardened by stigma and shame so their children can be adequately cared for. Pray for access to quality education. While 91 percent of girls and boys attend elementary school globally, as few as 10 percent of children with disabilities attend school. And only about 3 in 100 people with disabilities worldwide can read and write. This lack of access to learning opportunities presents a significant barrier to the well-being and future earning potential of a child with a disability. World Vision works to build safer schools and latrines accessible to children with disabilities. We also collaborate with and empowers community-based organizations to find local ways to help vulnerable children access a quality education. We also work to build safer, more accessible schools, for example in places recovering from a major disaster. Lord, in Your mercy, You have afforded some children with disabilities an opportunity to receive the remedial classes and other services through World Vision programs around the world. Change leaders’ hearts and laws so they will seek ways to provide learning opportunities for children with disabilities whose families can’t afford school fees or do not have access to a school nearby. Pray for parents and caregivers as they care for children with disabilities. More than 80 percent of people with disabilities in developing countries live below the poverty line, according to the European Commission. Parents, siblings, and sometimes friends or extended family members are the ones committed to caring for children with disabilities. World Vision provides training to parents and caregivers to transform attitudes toward children with disabilities. This helps them improve their relationships and learn how to nurture their children emotionally and spiritually and find ways for them to participate in society. Lord of all, we lift up parents and caregivers of children with disabilities. Refresh them. Give them strength to press on each day. For families living in poverty, lead them to economic opportunities to provide each member with the resources to survive and thrive. Pray for children with disabilities to experience God’s love. Living with a disability in extreme poverty threatens to rob children and families of the full life Jesus promises us, as well as their hope for the future. God’s love restores hope and brings life to our bones. Our trainings, advocacy, and overall efforts to include children with disabilities in community life aim to make Jesus known and love people as He first loves us. Lord, thank You for creating every child. Please equip World Vision staff, community leaders, families, and Your followers as they support children with disabilities, and encourage them. May they experience Your deep love every day. Every child deserves the chance to reach their God-given potential. Ease challenges for families and caregivers of children with disabilities.